Feeling okay, not feeling okay. It’s one of the hardest bits I’ve had to teach myself—allowing my littles to feel big, hard feelings—a lesson, essential in growing and nurturing humans that can adapt and overcome. I’m Jill. I’m a mama to three adorably joyful kiddos ages five, seven, and nine. While each have seen their share of yucky, painful, and uncomfortable feelings, our oldest has felt and experienced an onslaught of those big, hard feelings. Our oldest, whom we adopted at birth, was diagnosed with Fetal Alcohol Spectrum Disorder and Autism. I share these labels with you, not only with her permission, but also with the idea that the picture these labels can draw will help you see my perspective more clearly. When she was first diagnosed and I began my research into what the labels and diagnoses actually meant, I was quickly faced with the reality of children with similar diagnoses, particularly in the Fetal Alcohol world. Over and over again, I saw their lives swiftly turning into the rubble of low self-worth, depression, self-mutilation, drug and alcohol abuse, sexual abuse, incarceration and suicide, all before they hit their 20s. It was daunting. It was overwhelming. And, it was scary as hell. So, I did what any mama would do; what we are wired to do on a cellular level. I guarded my child with everything I had. I protected her from as much hurt and hardship as I possibly could. I began socially engineering her world, so that I could rewrite her future, and prevent her from being one of those looming statistics. Because that was my job—to protect her. This worked well for the first few years of her life. We had a beautiful bubble of inclusion and understanding. The friends we had—the friends we allowed to enter our world—embraced us, her, and our quirky way of restructuring our family-hood. We had a wonderful team of therapists and support that I could turn to when the barrier larger than I could tackle on my own, and we welcomed two new baby cakes (a sister and a brother) into our family, who adored her, forgave her, and championed her. Then, my oldest went to kindergarten. More hours away from her home, us, and the safety of her socially engineered bubble. She started to fall to pieces; anxiety began to grow. Loneliness became her best buddy. Her self-worth began to tank. We were losing our girl to more and more behaviors that were reflecting the pain and hurt she was experiencing and trying to process. So, from kindergarten through the start of second grade, I did what I could to bring her back. I advocated. I educated. I begged, bartered, and pleaded with families to speak with their children about tolerance and acceptance. I found activities that our daughter showed interest in and had a similar ability level in to her peers. I half-day homeschooled, so she had time to recoup—time to discover this world in a way her brain naturally craved. We continued working with play therapists, autism specialists, developmental pediatricians, and pediatric naturopaths. There were medications, supplements, and special diets. I became educated on childhood development and cognitive functioning, so that I could make sure I was meeting her where she needed me to, and truly comprehending her barriers. That way, I could build the proper support she needed to thrive. I was, by all accounts, doing everything right. But, it wasn’t working. The harder I worked to protect her, the more I was losing her. Early on in my discovery of Fetal Alcohol Spectrum Disorder, I read a book called Trying Differently, Rather Than Harder by Diane Malbin. After reading that book, I adopted its core principle as the guiding light to how we, my husband and I, would choose to parent our children. When something wasn’t working, we would stop trying harder and we would take different approach. 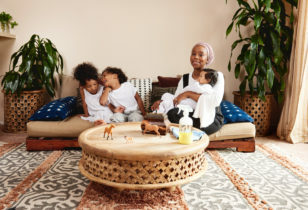 While this methodology was helpful in growing our tool box of ways to support and parent all of our babes, as soon as our oldest started third grade, we hit a thick, big, tall wall. Her loneliness and self-worth was at an all-time low, her challenging behaviors were at an all-time high, and I was absolutely exhausted. And, scared. I had no idea what to do next. Lucky for me, the Universe (or God, or maybe both) started giving me a pep talk. She said to me, “Jill, do differently. Seriously, do different. You’ve stayed in the lines of comfort for you, but how about you try something outside of your comfort level—something that is entirely out of your control? Go on kid, you’ve got this. Go feel uncomfortable.” It was so damn true. I might have been trying so many different ways to support my kid, but I had never actually stepped away from my comfort zone as the maestro of her world. I had beautiful intentions, but I was a little misguided. I had been protecting her, and now I needed to learn how to prepare her to handle a world that will likely not become much softer in her lifetime. I needed to learn how to prepare her to become who she was intended to be, despite the chorus of peers rooting against her. I needed to prepare her to stand up, be more quirky, be more colorful, and be more inquisitive. I needed to prepare, not protect. This is when the real work began for me. I had to learn how to slow my anxiety tornado down, and I had to find my intuition again. My tummy and my heart needed to take over the driver’s seat. I worked with an incredible social-emotional educator who was the foundation in restructuring how my brain reacted to the scariness of raising kids, and the true unknown they bring. When I shared with her the staggering statistics that had haunted me for so long, she offered me a different perspective—one that brought me back into the driver’s seat as my daughter’s guide in her life journey. My world started spinning in the opposite direction that day. What she told me was that our daughter (not unlike our other children) will have to endure a lot of really awful, really hard stuff in her world. She will exist with these challenges in different ways because of the unique wiring in her brain. But, if I am there to listen without judgement or a need to fix things, and look for the missing skill she needs in order to be able to cope with whatever challenge may be present, she is going to build that ability to cope and repair her broken heart and self-esteem. By allowing her (or any kiddo) a safe and supportive space to stay with uncomfortable moments, I’m inviting her to form those neural highways in her own wise mind. The roads paved by our own trusting, emotionally safe, and responsive connections are far greater reaching, and also unacknowledged by those scary statistics. When big feelings began to fly, I would put my hand over my forehead, a gentle reminder to my worry buddy that everything was going to be okay. I would then reach for my oldest daughter’s heart with my other hand. She and I had talked about our new plan prior to her big, scary feelings, so she knew this was my way of turning my tornado off, and opening up my heart for our connection. Some days, when things got incredibly hard, I would pass her a note that read, “Whatcha feeling kid?” A visual invitation to share her heart when her sensory system has gone all scallywhompis—those days when auditory and tactile approaches are just too much for her. And, just like that, she was coming back to me, to us. To herself. The more times we practiced our new practice, her light began to glow again. Her spirit filled rooms again. Her curiosity for this world began guiding her again. We had our daughter back. Prepare or protect has been my compass—both my North and my South. It has guided me to dead ends and to pastures filled with potential. I needed those years of hustle and fear to teach me how to work hard—how to never give up. 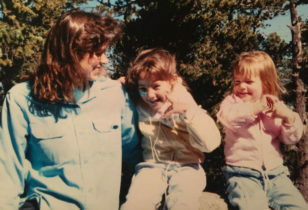 I needed them to learn how to “do” differently, and to see my children’s intended brains and bodies as far stronger than I could ever imagine. So, I leave you with this: I leave you with the encouragement that the job you’re doing—raising and growing a human being—is extraordinarily hard, complex, scary, and powerful. We have very little control over the pain they’ll feel, the heartbreaks that will come, or how many times they’ll lose, win, and fall. What we do have under control is our reaction to it all. Our ability as adults with developed frontal cortexes is to give our babes a safe space to feel big feelings—where we listen and validate and nurture. Because this will determine how our children will develop the ability to feel okay, not feeling okay.